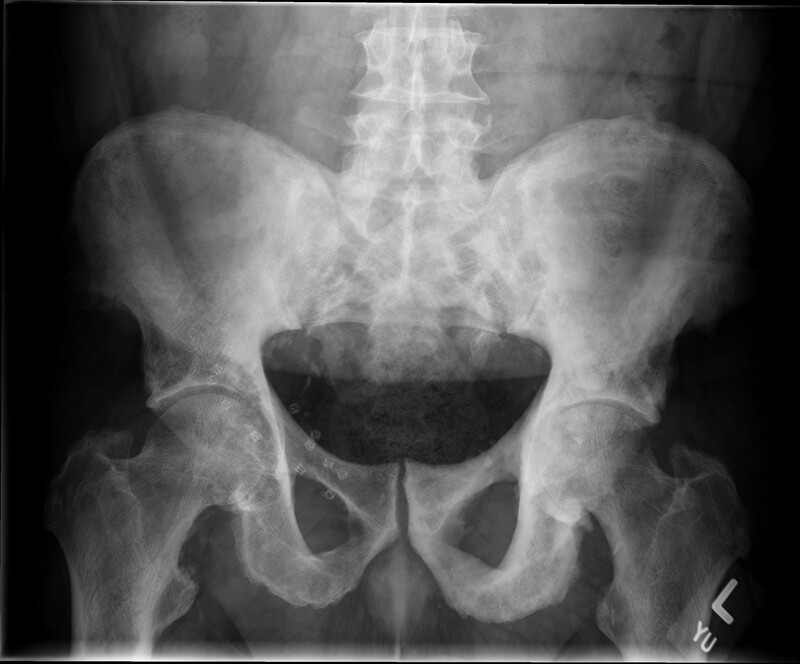 History: 60 year old male with hip pain. Full body images from a bone scan shows markedly increased radiotracer (Tc-99m MDP) activity in the pelvis. The differential diagnosis for this appearance on a Tc-99m MDP bone scan includes fibrous dysplasia, Paget’s disease, bone metastases, and primary bone tumor. This is a case of Paget’s disease. Paget’s disease is a disorder of abnormal and excessive bone remodeling, which results in deformed and weakened bones. It is usually asymptomatic, however, it can produce pain. It can lead to secondary osteoarthritis, as seen in the image below. Frontal radiograph of the pelvis shows marked sclerosis of the sacroiliac joints, as well as the iliac bones, left greater than right (correlating with the bone scan findings). Additionally, there is severe osteoarthrosis of the hip joints, with joint space narrowing and remodeling of the femoral heads. Thank you to Quinn Meisinger, M.D. for this great example of Paget’s Disease. are you using for this site? I’m getting sick and tired of WordPress because I’ve had issues with hackers and I’m looking at options for another platform. I would be great if you could point me in the direction of a good platform.